In small food processor or bowl, combine and mix garlic, lemon juice, dijon, parsley, Worstershire, egg yolk, anchovies, hot sauce (if using), and salt/pepper. Add half the cheese and mix until a creamy consistency. Set aside. Pre-heat oven to 375 degrees. On a flat surface, wrap chicken breasts in saran wrap and pound on both sides until flat and about 1/4 inch thick. In a large bowl mix olive oil, lemon juice, garlic, herbs, salt and pepper to make marinade. Add chicken breasts and let marinate for 1-4 hours in refrigerator. After marinated, remove chicken breasts and let sit in room temp for 30 minutes. Place breasts on a baking sheet and bake for about 20 minutes or until chicken is cooked but not dry. Remove from oven and let cool. In a large bowl, combine dressing and romaine lettuce and serve in individual bowls or plates. 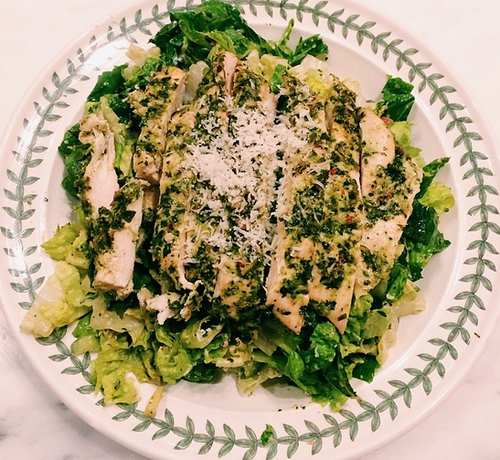 Slice chicken into strips and place on top of salad. Garnish with more shaved pecorino cheese. Enjoy!